In the time of Noah, humanity had grown so wicked in its sins that God, in His great justice, decided to make an entire end of the entire human race. 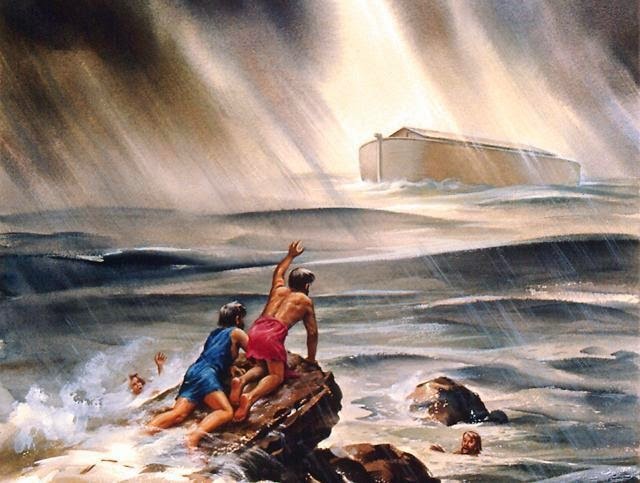 Thus came the Great Flood and took them all away, save for the eight souls who were saved on the Ark of Noah. This is one of many instances in the Bible when God displays His preference for working through 'remnants', that is, through small groups of people who are faithful to God despite massive apostasy going on around them. We see the same story again and again in Scripture: God has called for fidelity, but when the majority refuses to heed God's command, he wipes them away and continues with a very small minority - in Noah's case, a single family. Let us look at some of these 'remnant' scenarios in Scripture and then draw some practical conclusions from them. "And the Lord spoke to Moses, saying: "Go, get thee down: thy people, which thou hast brought out of the land of Egypt, hath sinned. They have quickly strayed from the way which thou didst shew them: and they have made to themselves a molten calf, and have adored it, and sacrificing victims to it, have said: 'These are thy gods, O Israel, that have brought thee out of the land of Egypt.'" And again the Lord said to Moses: "See that this people is stiffnecked: Let me alone, that my wrath may be kindled against them, and that I may destroy them, and I will make of thee a great nation." But Moses besought the Lord his God, saying: "Why, O Lord, is thy indignation kindled against thy people, whom thou hast brought out of the land of Egypt, with great power, and with a mighty hand? Let not the Egyptians say, I beseech thee: 'He craftily brought them out, that he might kill them in the mountains, and destroy them from the earth': let thy anger cease, and be appeased upon the wickedness of thy people. Remember Abraham, Isaac, and Israel, thy servants, to whom thou swore by thy own self, saying: I will multiply your seed as the stars of heaven: and this whole land that I have spoken of, I will give to you seed, and you shall possess it for ever. And the Lord was appeased from doing the evil which he had spoken against his people" (Ex. 32:7-14). Here we see God was about to wipe out all the Israelites and begin again with Moses alone. Moses' intercession saved them—an intercession, we ought to note, based not on pleas for mercy for the people but on an appeal to God's own reputation and glory. After the sins of the Kingdom of Israel, who followed in the idolatry introduced by Jeroboam, son of Nebat, God wipes away the ten northern tribes and allows only the two southern tribes of Judah and Benjamin to remain in the land. Then later, when King Manasseh of Judah outrages God by sacrificing children to Moloch in he Valley of Hinnom (2 Ch. 33:6), God swears to destroy Jerusalem as well, saying of His holy city: "I will wipe away the people of Jerusalem as one wipes a dish and turns it" (2 Ki. 21:13). How frightening a thing it is when God says of His own city, the home of His own temple, that he intends to wipe it away as one wipes a dish! "And it shall come to pass in that day, that the remnant of Israel, and they that shall escape of the house of Jacob, shall lean no more upon him that striketh them: but they shall lean upon the Lord the Holy One of Israel, in truth. The remnant shall be converted, the remnant, I say, of Jacob, to the mighty God. For if thy people, O Israel, shall be as the sand of the sea, a remnant of them shall be converted, the consumption abridged shall overflow with justice" (Isa. 10:20-22). God's promise to Israel will come to pass, despite their infidelity, but it will be fulfilled by means of a faithful remnant. Further prophecies about this remnant can be found in Isaiah 11:11, 11:16, 37:31-32, as well as Jeremiah 23:3, which says, "And I will gather the remnant of my flock out of all countries whither I have driven them, and will bring them again to their folds; and they shall be fruitful and increase." The small remnant does return, as narrated in Ezra-Nehemiah. Of that small remnant that is brought back to Jerusalem, only a tiny remnant of that remnant accepts the teaching of our Lord Jesus when He appears on this earth, a "remnant saved by grace", as St. Paul says in Romans 11:5. Our Lord, as well, affirms that God works through remnants when He says, "Many are called but few are chosen" (Matt. 22:14). When our Lord delivered His hard sayings on His Real Presence in the Eucharist and the multitudes and many disciples began abandoning Him, He did not try to prevent their leaving; He merely asked if the Twelve also intended to go away. He was concerned with His remnant. The lesson of all this is that God is not impressed by numbers. Yes, our Lord wants all men to be saved. But they will be saved on His terms, and if they will not heed Him on His own terms, He is willing to wipe them away and start all over again. He has delivered His truth and His commands, and if people are not willing to keep them, He will blot them out - even if He has to blot out an entire nation or even a race and start all over again from scratch. In none of these historical examples does God ever suggest that He will mitigate His law, relax His discipline, or soften His demands just because a large—sometimes very large—portion of His people are living in disobedience. He would rather wipe out the huge amount of dissenters and start fresh than relax even a single point of His commands on their behalf. This is extremely relevant given current discussions about mitigating the Church's long standing discipline of denying communion to people living in adulterous "second marriages." The contemporary wisdom, exemplified by Cardinal Kasper, suggests that because there are so many Catholics living in this state who cannot receive communion, there is an "abyss" between Church practice and the real experience of couples in concrete circumstances. If the Church were to continue to deny these people communion, we might lose a lot of people. Therefore, we need to accommodate their rebellion by softening our discipline. This is not the way God works. God is not impressed by the number of people living in "second marriages", nor is God afraid to lose them all and work again from a remnant. Reflect again on that passage from Exodus; God had done wonders to bring these people out of Egypt and had given them the Law in a manifestation of divine glory unsurpassed in the Old Testament. According to the census at the time of the Exodus, Moses led 603,550 men out of Egypt (Num. 1:46); a massive throng of humanity! Even so, when they all rebelled, He was prepared to destroy them all and start all over again with a single man—essentially, go back to the starting point he had established with Abraham centuries before. He was not impressed with the numbers of the rebels; no angels made the argument that an abyss existed between God's demands and the concrete pastoral circumstances of the Israelites that needed to be bridged; they held no committee meetings on the "problems" of Israelite religion. "Let me alone that I may consume them." God was ready to destroy them all and start over again with a single man. And note that it was not by pleas of mercy for the Israelites that Moses' intercession saved them, but by appealing to God's glory and His own word. You see, God is not afraid of working through a remnant. Cardinal Kasper is. When God saw that the vast majority of Israelites were worshiping the golden calf of Jeroboam, He did not decide look for a new pastoral solution to the "problem" of Israelite idolatry by applying the medicine of mercy to idolatrous Israelites in concrete pastoral situations. God was not scared by the prospect of losing ten out of twelve of the tribes, which, by the way, works out to be 83% of His chosen people. When a progressive prelate sees 83% of Catholics are contracepting, he frets about how we can soften discipline and retain those 83%. When God sees 83% of the Israelites committing idolatry, He says, "Oh well. I still have 17% left to work with." Again, if Jesus sees the majority of His followers deserting Him, He does not wring His hands and talk about the disconnect between His teaching and the experience of His followers, nor posit that the problem is with His message. He merely turns to the disciples, the faithful remnant, and asks what their plans are. Let us remember, too, the Catholic Church in the days of Pope Clement VII was willing to lose the entire Kingdom of England, and create an innumerable host of martyrs in the process, rather than compromise on one point of doctrine. The Church in that day did not care about the "abyss" between Henry VIII and the Church's teaching; if an abyss existed, it was created by the sins of those who valued their own lusts above the teaching of our Lord. "Then there came a voice to him that said, “What are you doing here, Elijah?” He answered, “I have been very zealous for the Lord, the God of hosts; for the Israelites have forsaken your covenant, thrown down your altars, and killed your prophets with the sword. I alone am left, and they are seeking my life, to take it away.” (1 Ki. 19:13-14). "Yet I have reserved seven thousand in Israel, all the knees that have not bowed to Baal, and every mouth that has not kissed him.” (1 Ki. 19:18). Again, a small, faithful remnant. Seven thousand men who had not corrupted themselves with Baal worship; and not only has God reserved this remnant, but He plans to use it to judge the unfaithful mass! By the way, this is the very passage St. Paul cites in Romans 11 when explaining why so few Jews have accepted the Savior: because in cases of mass apostasy and infidelity, God works through remnants. The constant focus of God's action, in the Old and New Testaments, is on the remnant. When all Israel is ready to apostasize and stone Moses, it is Moses God is concerned with; He is ready to consume the unfaithful. When ten of the twelve tribes go after foreign gods, God sends them away into oblivion. When Jerusalem sins, God wipes them away like one wipes a dish but encourages the small remnant who remains to be faithful. It is the remnant that must be encouraged, the remnant that must be strengthened, the good of the remnant which must be preserved. It is the remnant which will fulfill God's will; it always has, whether that remnant was 7,000 men, as in the case of Elijah, or a single man, in the case of Moses. The modern Church is fundamentally afraid of entering into a remnant scenario; petrified of a circumstance when the world scoffs and laughs at her, in which she loses all relevance. And therefore she tries everything to postpone or avoid this state of affairs, even to the point of compromising very basic Catholic disciplines and inventing ingenious ways around doctrine. Ultimately, it is because they do not trust God. They care about numbers; "What are we going to do about declining Mass attendance?" "What about these abysmal baptismal statistics?" God doesn't care about your numbers; He cares about truth. Just preach the truth. Let God worry about the numbers. If hearts are soft, they will repent and come back by the preaching of the truth. If not, the truth will serve as a sword against them, and they shall go forth, and God will wipe them away as one wipes a dish, and the 7,000 who have not bowed the knee to Baal will rise up in judgment against them, and the Lord will start over again if He needs to, working out His mysterious providence through the remnant that He has chosen by grace. God works through remnants. And He doesn't care about the numbers. He will wipe everything out and start over if He has to. He's done it before. It's the way He operates. Well personally I think that God's leadership style leaves much to be deserved, we did not have to be in this situation today; up until the late 60's Catholics were very faithful, Then came the decades upon decades of bad clergy poisoning their flocks. We're here because God IS SOOOOOO obsessed (being more legalistic than the pharasees ever were) that his Mother be honored in the absolute manner that she decreed at Fatima. Pope Pius XII consecrated Russia to the Immaculate Heart, albeit not following precisely the instructions of Fatima. Given that he had spent most of his pontificate with the Nazi's at the door, and of his own admission was ill informed regarding Padre Pio who lived in the same country, could God not have accepted his Intention even if he didn't follow the instructions to the letter? Does he really care that millions of children will grow up in broken homes because of this, does he give a crap about the suffering as a result of him giving up on us? I want to love God, I really do, but all I see is the cosmic tyrant of Hitchings / Dawkins et al, albeit one that actually exists. ACTUALLY, at the time Charles V, Holy Roman Emperor had control over Rome and thus influence over Pope Clement. The Pope had granted plenty of annulments before, but he just wasn't going to because he was being pressured by Charles, who was Catherine of Aragon's nephew, not to do so. Of course, liberals will always worry about what they worry as long as they find it convenient. Ecclesia depopulata? No, they just didn't care (and the Council had nothing to do with it). So, are they really worried? It depends. Their agenda always comes first. Did I say agenda? Yeah, well, bringing the house down. That is a serious oversimplification. Yes, Clement was initially well disposed to Henry. Yes, Charles pressured Clement against granting the annulment.But there is no evidence that Clement made his judgment on anything but sound canonical principles. Otherwise why the rigorous investigations in Rome and England into the details of the Bull of Julius II? Why the consternation when the second Brief of 1528? Sure, Charles took sides, but that does not mean Clement made his judgment because of that. Furthermore, remember that Henry shifted the ground of his argument midway. Initially, Henry argued that the Bull of Julius was invalid because the motives alleged by Julius were insufficient and contrary to the facts. However, after 1528, Henry changed his argument - now he was saying he Bull was invalid because the pope did not possess the power to dispense a man to marry his brother's widow. It was this second argument that Henry staked his whole case on, and since it was a direct attack at papal authority and tradition, Clement refused to grant it. Charles did not want him to either, but the attacks implicit on papal authority were more compelling. what a fantastic article-and so true.the church is in a hell of a state with the bishop of rome fiddling whilst rome burns.as you say the truth is the truth.it wasn't ,and ,isn't so bad when i was growing up and it isn't now!i love the church and always have.if remnant i will be then remnant it is.at least we will have kept the one true faith of the mystical body of christ .great article! god bless .philip johnson. Well even mother angelica has publicly stated that she does not think all is being told regarding Fatima and the supposed consecration of Russia. Sure, Russia was consecrated by tacit of being part of the world. But it was an act of disobedience and he did not do what Our Lady wished, she specifically named Russia yet the popes were afraid to name Russia due to political correctness. The more I learn about the eastern church the more I am beginning to understand the potential problems with belief and tradition. Our Lady saw what will happen and what is happening now, she wanted to prevent something from unfolding, but it looks like we are about to witness what she was trying to prevent as the situation with Russia and other situations around the world continue to unfold. Our Lord does go in search of the one lost sheep, however. I think, that being God, I would want things my own way. I'm sure you understand. You admit, that you, not being God, find his was dissatisfying to your preferences. You want your own way. So you know how it is. Except that you are not God. If you want to see how specific God is, read Leviticus. That was pretty much about some tents, and tableware, and a box. Now we have God Himself coming down at the call of ANY priest and hiding as bread. But our preferences should take precedence, right? If the Church was in good shape in the 60's, there is no way the cultural upheavals would have happened. We are being chastised, but since we have stiff necks, and will not repent, it is gonna get much, much, worse. It was our preferences that got us into this mess. Perhaps it is time to let them go, and see what the Lord and Creator of the Universe, the only One who actually knows what is best for us, might suggest. I bet it will turn out to be the same thing He has always suggested. Humility, 10 Commandments, and conformity with His will. Its worth trying, at least.